Posted on February 13, 2014	by Katy K.
Here are the last of of Cybils Middle Grade Graphic Novel Finalists – at least until next year! I am very curious to see which one wins. There were a couple my son didn’t want to read, but he’s loved all the ones we did read, and neither of us could pick a favorite. 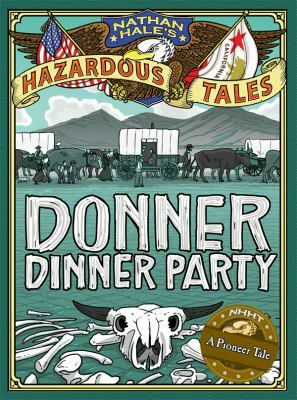 Nathan Hale’s Hazardous Tales: The Donner Dinner Party by Nathan Hale. Amulet Books, 2013. Even before this made the Cybils shortlist, my colleague Mrs. M brought this to my attention, saying that her nine-year-old daughter had stayed up late to read it and loved it. My son, however, heard the premise and decided that it sounded too hazardous to read. I’m 2/3 of the way through reading it myself right now. The story of the ill-fated cross-country pioneer journey is told through the framework of the spy Nathan Hale, in 1776 (whose knowledge has merged with that of the modern-day Nathan Hale, born in 1976), postponing his hanging by telling the story to the British guard and the hangman. Hale does a good job of pulling out kid characters for kid readers to latch on to and keeping facts clear while finding the humorous side of a grim tale. The hangman makes frequent interjections, over-reacting to tense moments in the story in a way that effectively breaks the tension. I haven’t yet gotten to the critical gruesome moment, but so far, it looks like it will be handled in a way that’s perfect for horror-loving, but still sensitive kids. Still, given both the subject matter and the density of the text, I’d give this to kids on the older end of elementary and into middle and high school. 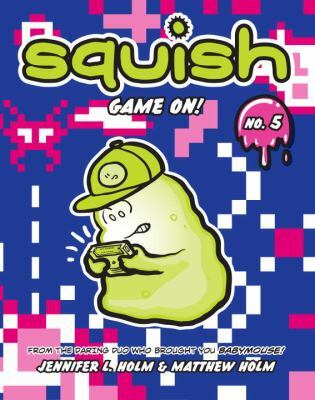 Squish 5: Game On! by Jennifer Holm and Matt Holm. Random House, 2013. This is the latest volume in the newer series by the authors of Babymouse. We read our first Babymouse as a Cybils nominee this year, too. It’s not that the Babymouse book that we read was especially girly, but all the Babymouse books are very, very pink. Squish is an adorable amoeba, illustrated in green, still having typical school adventures. In this volume, Squish gets addicted to video games and neglects both his homework and plans to attend a comic convention with his dad. It is adorable (yes, I used the word adorable twice. I needed to. ), funny, easy-to-read, and very, very relatable. I have found a series which my son will voluntarily devour, reading through a whole book in a single sitting – this is so rare that it is cause for great celebration. I am not bringing the whole series home at once partly because he needs to do some reading at his level (this is slightly below) and partly because there’s never more than a book or two available in the library at any given time. 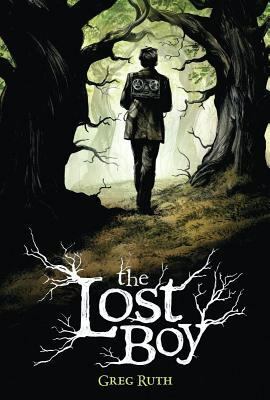 The Lost Boy by Greg Ruth. Graphix, 2013. Moving into a new house, Nate finds an old reel-to-reel tape recorder hidden under the floorboards of his room. When he listens, he finds that it’s the journal of Walt, a boy who went missing decades earlier. But Nate and the neighbor girl, Tabitha, are seeing some of the same things – or rather, people – that Walt described. There’s a large grasshopper riding a tiny horse, a squirrel in a hunting costume, and an old china doll with a giant button on his overalls. It’s a creepy story, illustrated in dark pencil and gray watercolor, where the villain is a terrifying tree man and even the good guys don’t necessarily look reassuring. The story goes back and forth between Walt, on his way to disappearing, and Nate and Tabitha trying to solve the mystery. I’m finding that my boy is not interested in spooky: he was not interested in reading this book even after I pre-read it for him and assured him that no kids came to harm in it. For readers who appreciate their stories on the creepy side, though, this is excellently done. This entry was posted in Books and tagged Armchair Cybils, youth graphic novels. Bookmark the permalink.